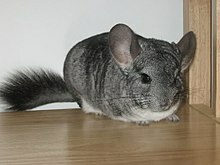 The Chincilla is a small rodent. They live in the Andes in South America. They are active durin dusk an dawn. Such an activity pattern is callit crepuscular. Together wi the Viscacha, they form the Chinchillidae family. This page wis last eeditit on 23 Februar 2017, at 01:48.